Phoenix in flames in the Ashmolean Bestiary, MS. Ashmole 1511. The New Moon in Aries arises on March 27 with Venus retrograde close by, for on the days surrounding it, Venus will be rising at dawn with the Sun, invisible to the eye, purified and regenerated by the light of our fiery star. Seven hours before the New Moon, during the darkest phase of the Moon, the Moon will conjoin Venus retrograde exactly. As we have experienced a rebirth of Venus in the days leading up to the New Moon, so does the Aries New Moon signal a shift in emphasis on astrological elements toward the Fire triplicity, a fiery movement that will continue to build in the seasons ahead. The Sun, Venus retrograde, Mercury, Uranus, and Eris are all in Aries, with Saturn in Sagittarius forming a trine with Mercury, Uranus, and Eris. Fire, particularly as directed centrally by Aries, is direct, passionate, impulsive, fast, and courageously creative. As recent astrological transits have facilitated awareness of inner needs and desires, the Aries New Moon is a call to to take action with full presence to set in motion the elements of life that align with developing goals and visions. In the collective there has already been incredibly discordant debates and violence erupting with even more building, and the Aries New Moon will signal a release that will lead to clamorous conflict akin to the hammering of enraged rams slamming horns. As the Moon begins to increase in light it will soon come into a square with Pluto, an opposition with Jupiter, and then a conjunction with Uranus. There are not really any current astrological transits that support reconciliation or mediation, and so the more likely outcome will be hard fought battles between entities refusing to compromise or give in. In the personal realm it may be necessary to fight for one’s rights or stand one’s ground against encroaching threats, yet the fiery astrological transits also can facilitate incredibly inspirational collaborations that dynamically push past what we previously thought possible to create. At the same time battle lines are being drawn and power structures are shaking in tumult, great amounts of spirited fire can be invested into creative projects that will ultimately manifest gifts to share with the world as the early visions of this time turn later into solidly developing forms. Mars in Taurus rules the New Moon and is sextile Neptune and trine to Pluto in Capricorn. This is a Mars that can be stubbornly fixated upon acting from a belief system that may in the end be more about a fantasy of what one hopes to be true rather than grounded in clarified reflection. These aspects surrounding Mars can also amplify fighting between those positioning themselves for positions of power, especially seats of power that appear glamorous within consensus reality. However, these same aspects surrounding Mars can bridge the immaterial with the material, and support drawing from imaginative vision to fuel work. The New Moon is ideal for locating tangible resources and taking concrete action to make far reaching visions take shape. Out of the chaotic yet fertile void of the previous lunar cycle tied to eclipses, like the creator Sun bird Bennu we can step from the primordial sea onto solid ground to set dreams in motion. Mars is also applying to a conjunction with Ceres in Taurus, and will continue to approach Ceres until forming a conjunction on the day of the upcoming Full Moon in Libra. What does Ceres have to teach Mars as the Moon waxes full, and what influence will Mars be having on Ceres? An obvious correlation is the enraged Ceres of myth, hell bent on finding revenge and seeking retribution for her daughter Proserpina being abducted by the lord of the underworld. The Aries New Moon aligned with Venus retrograde, ruled by Mars in Taurus likewise supports digging in to hold one’s ground against forces of oppression and avaricious agents seeking to plunder nature to increase power. Ceres as an archetype of the Great Mother can also guide Mars toward protecting those who are vulnerable and in need of support rather than taking advantage of the less fortunate. Venus retrograde is combust and has only separated a few degrees from her exact conjunction with the Sun at the time of the New Moon. Purified and regenerated, Venus retrograde has been cleansed but has not come wholly back into full presence and visibility as a Morning Star. As the Moon waxes through its crescent phase at the end of March, Venus will emerge again as a sentinel of our rising Sun as a Morning Star. On April 2, a day before the Moon reaches its first quarter phase, Venus will move backward into the sign of Pisces where she will remain for most of April. The rebirth of Venus we can experience now is still somewhat unconscious and not fully formed, with remnants of old patterns still being released while new feelings slowly begin to emerge from within. Mercury is a brilliant Evening Star at the New Moon, separating from a conjunction with Uranus in Aries and applying to a trine with Saturn in Sagittarius. Mercury will be a bright Evening Star as the Moon waxes toward fullness, and then will station retrograde on April 9 at five degrees of Taurus, a day before the Full Moon in Libra on April 10. Mercury is in a strong position at the New Moon to illuminate insights that are dynamic and innovative while also being practical enough to manifest in material reality. The conjunction of Mercury with Uranus and trine with Saturn is also not a fleeting, one time affair as Mercury will be returning to station direct in conjunction with Uranus and trine with Saturn following its retrograde on May 3. The Aries New Moon as a result is ideal for seeding ideas that will be able to bloom more fully in the coming season of Beltane. The Aries New Moon falls within the first face of Aries associated with the Two of Wands card illustrated above by Pamela Colman Smith. In the image we find a conquering figure holding a globe in one hand as he gazes from atop a fortress out into an expansive terrain. It is the body of water that appears to have secured his focus in this moment, and the presence of the globe seems to imply a moment of reflection regarding expanding his influence or dominion. The grandiose ambition and confident assertion present in the image is fitting considering that Mars rules the first decan of Aries, giving Mars both domicile as well as face dignity here. In 36 Faces: The History, Astrology, and Magic of the Decans, Austin Coppock ascribed the symbol of “The Axe” to this decan which has a long association with furiously martial figures who dominate enemies and assure victory in battle. 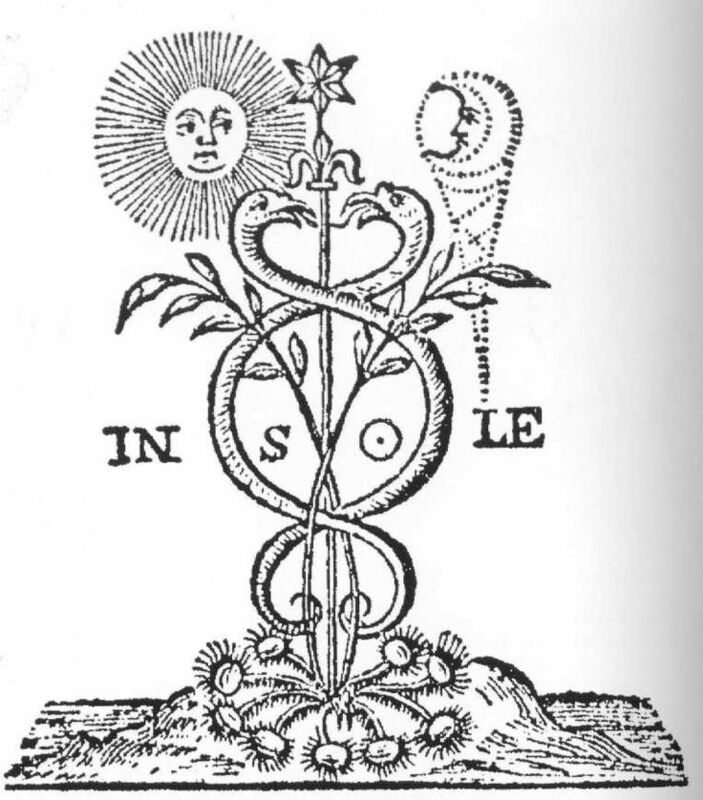 Coppock deepened the symbolism of the axe through linking it to the splitting and separation from the One necessary for creation and growth, for example in the cutting of the umbilical cord of the child from its mother and in the use of axes in controlling nature to make a home in the wilderness. Coppock linked this separation to “building a distinct and individual life . . . the individual yang struggling out of the collective yin” (p. 54). The Dark Goddess is a goddess of the self, not in the sense of selfishness or separateness, but from a stance of upholding individual integrity. The Black Moon in us will accept nothing less than the expression of our true individuality. When we are secure in acknowledging and expressing our authentic self, we are less likely to falsify ourselves in order to be accepted by others. We are then not so vulnerable to becoming entrapped in situations which deny and disempower us, which is where Lilith’s self-destructive cycle begins. With Venus retrograde in Aries and Mars in opposition to Black Moon Lilith, the Aries New Moon facilitates drawing from the fires of anger and passion to burn off patterns of placating conformity in order to empower and embody one’s heartfelt, deep, and authentic presence. Allowing moments of full feeling without shame and judgment will open access to the primordial creativity found within that will not only empower one’s own individual talents but also bring empowerment to others through direct expression and sharing of our essentiality. George, Demetra. (1994). Finding One’s Way Through the Dark. AFA. As always Gray, a well tempered and informative post! Aloha. Yes its been some crazy times in this lunar cycle. Thanks again for your comments, Bela. Insightful and prescient, Gray has once again given me a lot to think about. Reading out loud. Aries people be attentive.